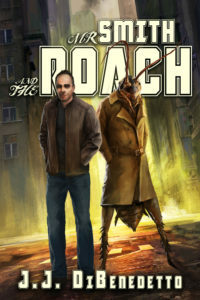 The Day of the Roach Has Arrived! Yes, it’s true! 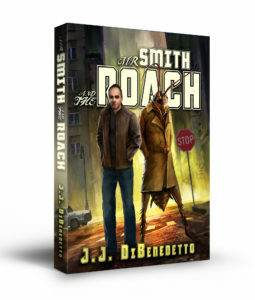 MR. SMITH AND THE ROACH is officially out today! It’s even on sale to celebrate the launch (and of course because it’s Cyber Monday). Click on the link above, or on the cover image, to find it at the ebook retailer of your choice. It’s available in paperback, too! There’s even an audiobook on the way – I’ll have more news about that, and a sample for you to listen to, in a week or two! John was at a loss. There was something very off about Sam, but he couldn’t pin down what it might be. While he chatted with the man on the drive back into Manhattan, his subconscious mind worked the problem; he’d always been able to multitask like that in his days on the force. But no revelations were forthcoming, and all he could do in the end was chalk it up to unease at the idea of having to share his apartment at all. Sam stared at him, with those weird eyes. The pupils, what there was of them, were almost red, now that he really looked at them. And then the man laughed. “You think – oh, that is good! You really have no idea, do you?” John didn’t. He just sat in the passenger seat, staring at eyes that he’d almost call inhuman, and a mouth that didn’t really seem to have anything in the way of teeth. And then Sam took off his hat. Up until five minutes ago, John had never, not once in his life, fainted. Not even on his very first case as a rookie, twenty-three years old and fresh out of the Academy, when he’d walked into the aftermath of a “business dispute” between the Gambino and Bonanno families. No. He was not all right. He was obviously suffering from some sort of psychotic break, because there was a giant insect sitting in the driver’s seat of this car, offering him a bottle of water, and that couldn’t possibly be real. Or, he could have been drugged, although his head seemed clear, and he didn’t seem to be experiencing any of the other effects he’d expect to feel from any of the most common illegal drugs.